There used to be an airshow at Smyrna, TN each fall, and I was there each and every time. I think that for a number of years they stopped having it since I never heard anything about it. Regardless, the Great Tennessee Airshow is back and it was this weekend! And once again I was there. I was born to an aviation family. Both of my parents were pilots and actually met at an airport. I have my pilot’s license as well even though I haven’t flown for a number of years. Aviation is in my blood though and I have loved airplanes for as long as I can remember. Seeing them in person is good, but watching them strut through the air is even better. Not as many airplanes on static display as I recall, but still quite a few. Take note of that brilliant blue, cloudless sky in most of them! The traditional opening to an airshow is a parajumper with the American flag. In this case it was the legendary Cheryl Stearns. Her accomplishments are too numerous to note here so just take a look at her web site. Like I said, static displays are good but aircraft in flight are even better so let’s watch something FLY! A few propeller-driven planes to get things started. Make sure the ear plugs are properly seated because here comes some noise. Well, not really. It may be loud but it’s more like music to some of us. This is a US Navy F/A-18 Hornet. 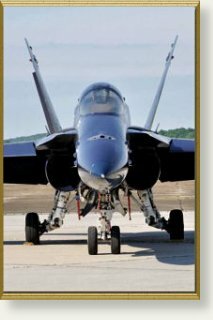 There are a couple of photos of it on static display back up the page a bit, but looking at one of these sitting on a ramp is like looking at a photograph of a glass of beer when you are thirsty. It’s just not the same thing. They have to be seen and heard to be truly appreciated. The Hornet and the Corsair shown above did a “Heritage Flight” of the old and the new. The Corsair is famous for its exploits in WWII and the F/A-18 is the current fleet defense fighter of the US Navy. Mike Goulian flew his Extra 330SC but take note of the sky in the background. That brilliant blue sky from earlier today is gone and has been replaced with slate gray skies. The sprinkles started during his exhibition so my camera went in the bag. I started to pack up and leave but then the announcer stated that the F-15E was flying next, and to be honest that is the airplane I went to the airshow to see. The US Air Force Thunderbirds are fantastic but to me there is absolutely nothing flying in the world today that epitomizes air power like the F-15 Eagle. So even though it was raining and I had to keep stuffing my camera under my rain jacket while the airplane was out of range, I wasn’t about to leave yet. Even though the Eagle looks like it’s taxiing on the grass in the first photo it really isn’t. The taxiway is slightly lower than the grass on top of the hill between us, but it is an interesting illusion. The rain that is visible in the photograph is no illusion though. That was it for me though. The rain was getting heavier so I packed up and called it a day. I didn’t get to see the Thunderbirds fly, which I do regret, but I’ve seen them several times before and have vivid memories of their shows. Needless to say, when I got home the sun was shining.